For the last few days, I've been having a lot of fun playing around with Celestia, an open-source 3D space visualization program. I've gotten the Jupiter and Saturn systems working just fine with NAIF spice kernels, got all the moons rotating correctly, and so on. 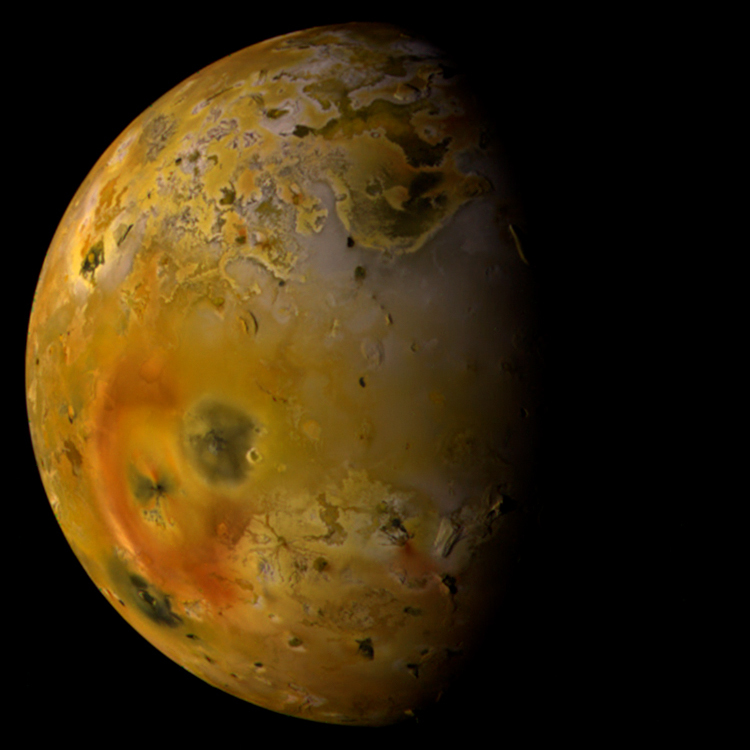 Now I decided to play around with making a bump map for Io. You can see the state of this bump map at left, implemented in Celestia. I got most of the paterae in this area looking about how they should. The mountains take a little more time and require a lot of hand editing. I'm not quite satisified with the blocky appearance of the mountains, may have to try some smoothing. I am also a little concerned by the way it shows mountains and other topography. Mountains are visible way to far around the dark side of the terminator (these things aren't that tall). They are also way to visible at low phase angles. But at phase angles like that above, I am pretty happy with the results. 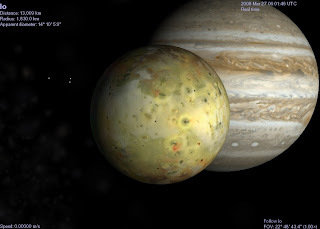 Mike Salway posted a cool animation of images he took of Jupiter, Ganymede, and Io over at the Cloudy Nights forum. These images were acquired on March 19. You can see a rotating Io, Io on the near-side of Jupiter orbiting off to the left, and Ganymede on the far-side of Jupiter orbiting off to the right. Note that you can see Ganymede emerging from an eclipse in the first frame. 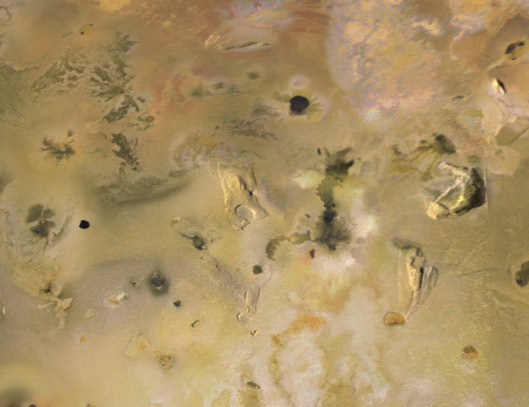 The April issue of the prominent Planetary Science journal Icarus is now online for subscribers. Among the articles in this issue are two that are directly related to Io. 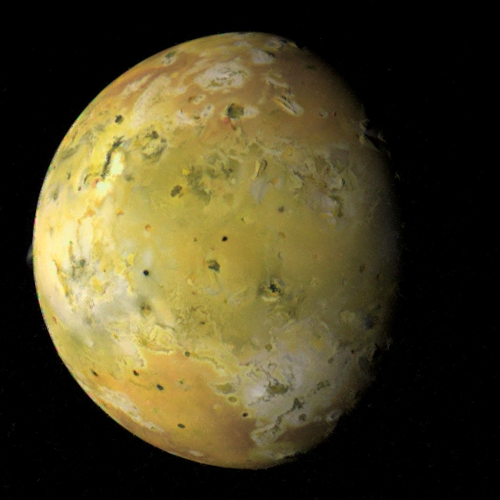 The first, by José Luis Alvarellos, Kevin J. Zahnle, Anthony R. Dobrovolskis and Patrick Hamill, is titled "Transfer of mass from Io to Europa and beyond due to cometary impacts." 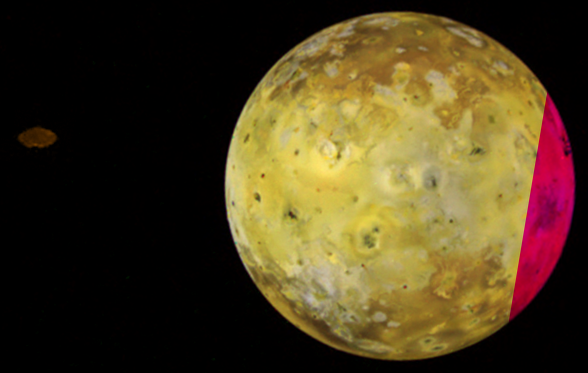 In that paper, the authors presents the results of modeling ejecta from impacts onto the surface of Io and where that ejecta eventually end up. The second paper, by Donia Baklouti, Bernard Schmitt and Olivier Brissaud, is titled "S2O, polysulfuroxide and sulfur polymer on Io's surface?" In that paper, the authors discuss laboratory spectral measurements of S2O and other polysulfuroxide and experiments to see if condensates from these compounds are stable on Io's surface. I will try to read through these papers this weekend and give a more thorough review of them here tomorrow. 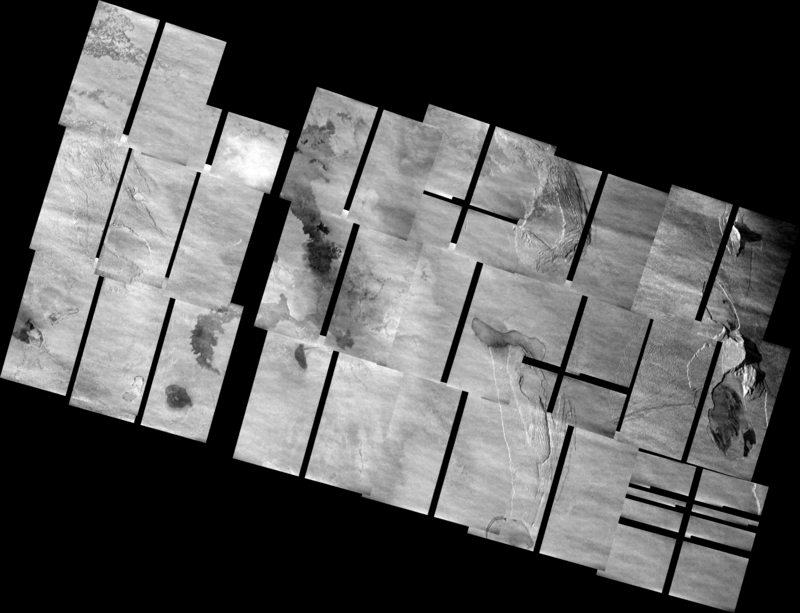 I've started processing some of the mosaics from the Galileo I24 flyby that took place on October 11, 1999. 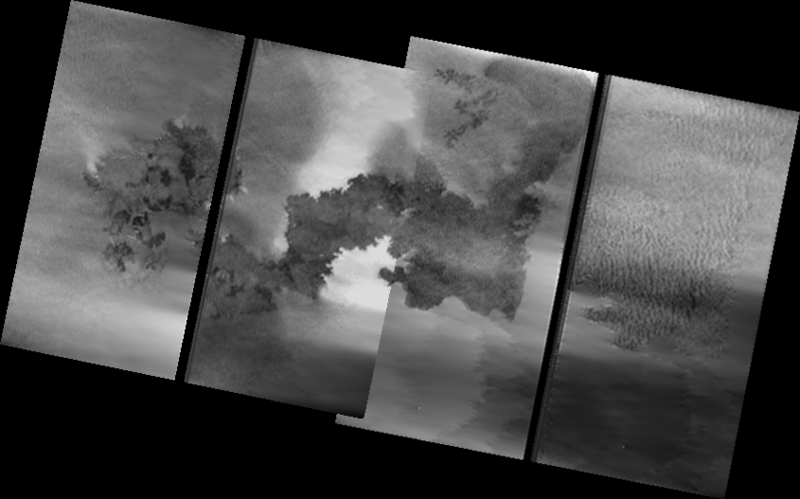 Most of the images acquired during this flyby were taken in 2x2 summation mode, so the images had half the resolution of normal mode images. 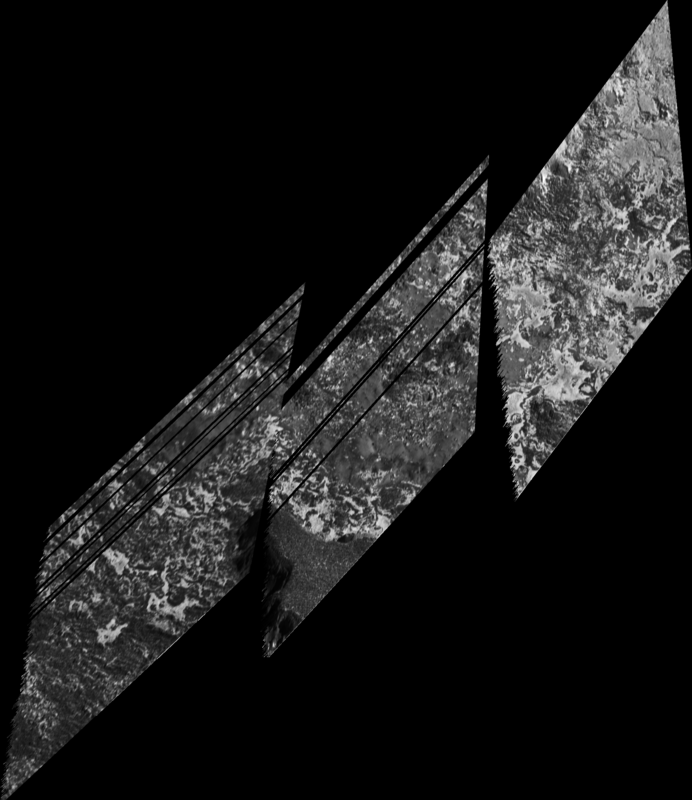 Unfortunately, an error in the camera, that began on the previous orbit, caused these images to become scrambled. Luckily, an algorithm was developed that reconstructed the scrambled images. So tonight I started working through some of these for my images page, particularly the 24ISPILLAN01, 24ISCOLCHS01, and 24ISZAMAMA01 mosaics. Ordinarily, I would initially process these images in ISIS before piecing the mosaics together in Photoshop. Unfortunately, these reconstructed images aren't fully in PDS-compatible format so ISIS can work with them beyond the initial conversion to ISIS. So I can't reproject them, which would make it easier to piece them together. So everything was done in Photoshop, piecing them together and adjusting each image so that they would fit together. I think the results turned out pretty well. 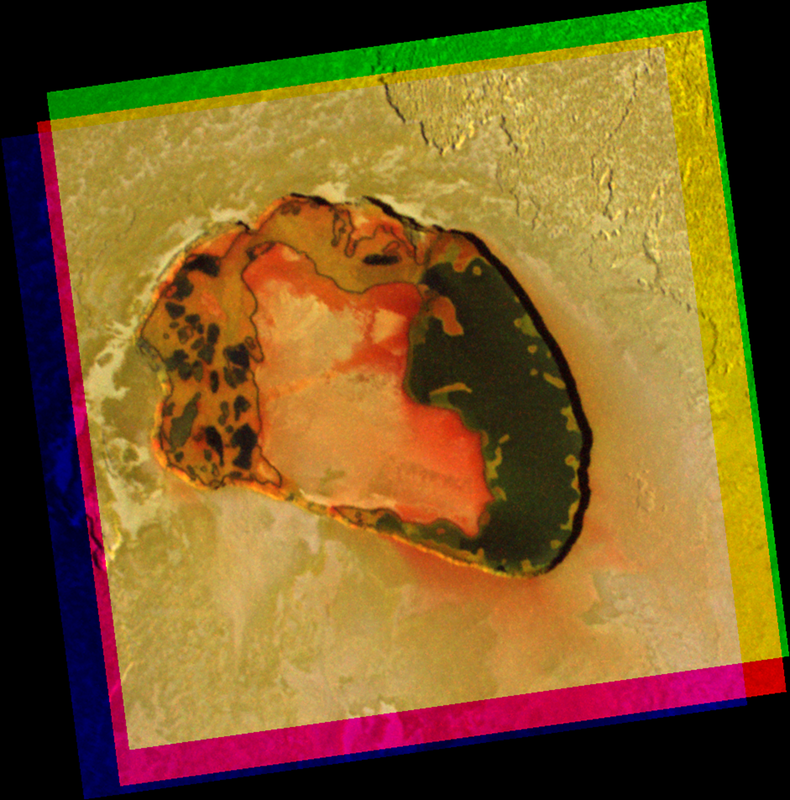 24ISPILLAN01 covers a lava flow that formed during the summer of 1997 north of Pillan Patera on Io's trailing hemisphere. 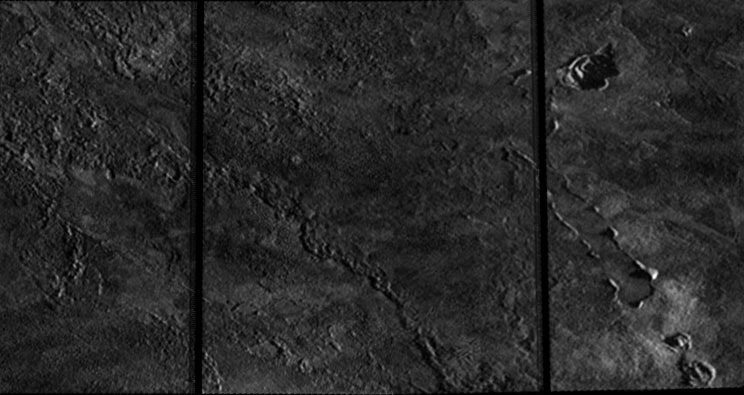 The flow can be seen as the darker material on the western two-thirds of the mosaic. According to Williams et al. 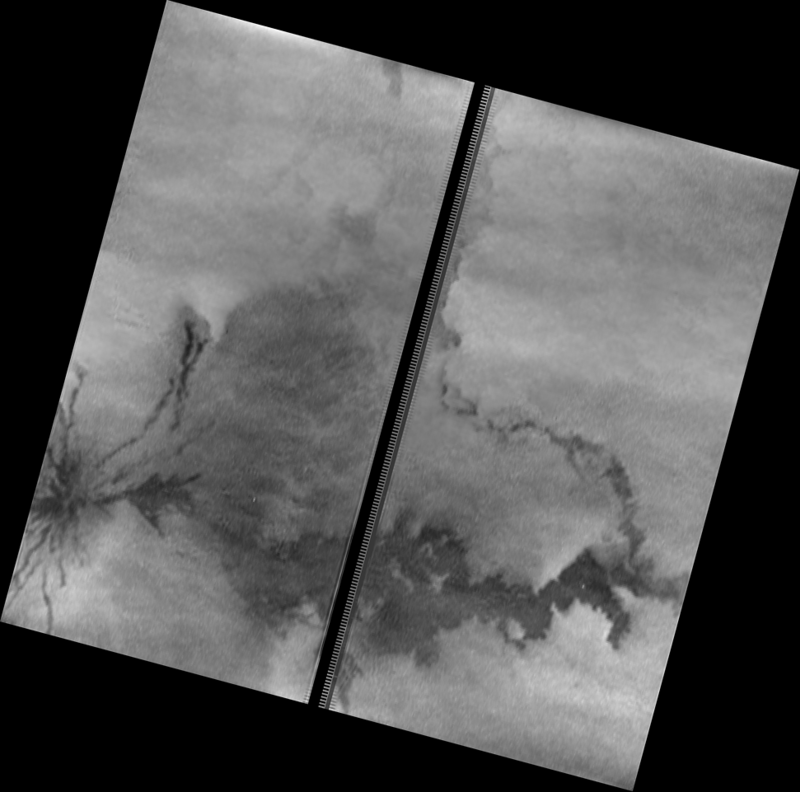 2001, the lava flow appears to have been emplaced as a turbulent sheet flow, with few apparent channels. 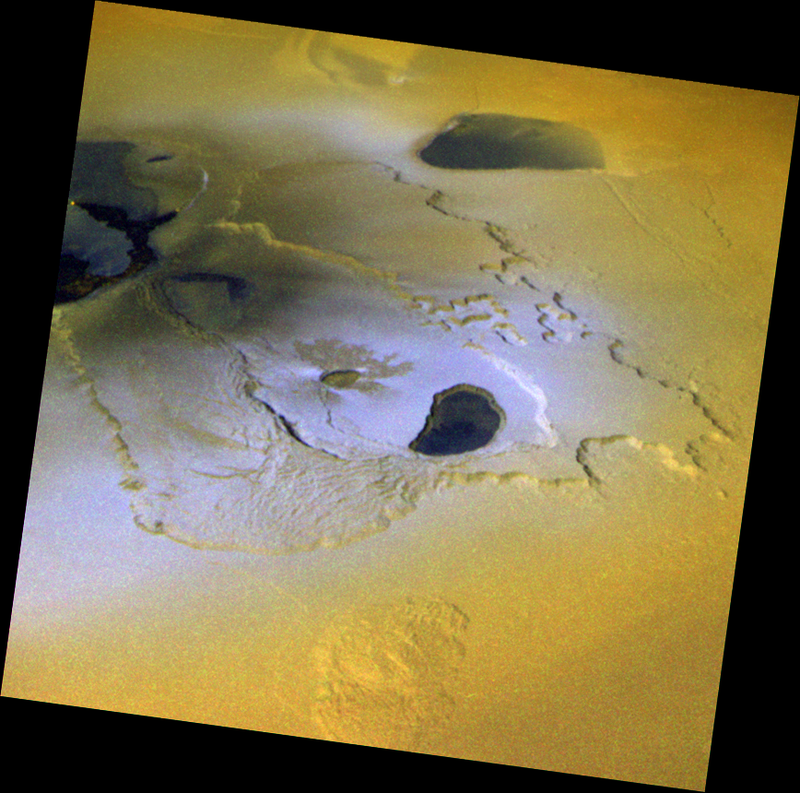 Several pits are also seen that maybe rootless cones, formed from the interaction between the hot, flowing lava and the sulfurous frost beneath. 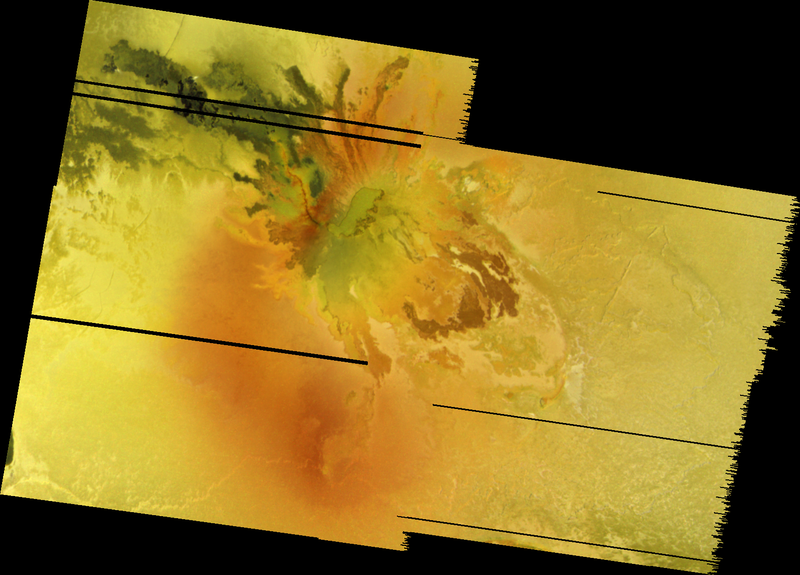 On the eastern third of the mosaic, the terrain that existed before eruption can be seen. It appears hummocky with at least one apparent flow margin, suggestive of a prior eruption at this location. It isn't certain if the hummocky nature of the surface existed before the 1997 eruption, or if it is related to pyroclastic processes that occurred during that event. 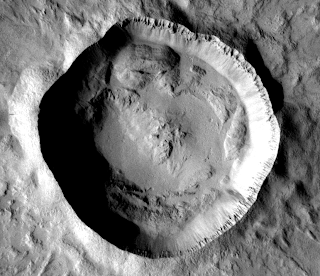 24ISCOLCHS01 is a high-resolution mosaic covering Ot Mons in the central part of Colchis Regio. The mountain is covered in numerous hummocks, similar to the surface of the northern component of Hi'iaka Montes, and is likely related to the degradation of the mountain. 24ISZAMAMA01 covers the southern portion of the Zamama lava flow (a major volcanic center during the 1990s) and the surrounding terrain. The Zamama vent is just to the upper left of the mosaic and is surrounded by lava flows radiating out from it (see this image from the 24ISZAMAMA02 observation for context). The toes of some of the flows that radiate south can be seen at the far left hand side of the mosaic. To the east of those are bright, incised channels that might be related to sulfur volcanism. 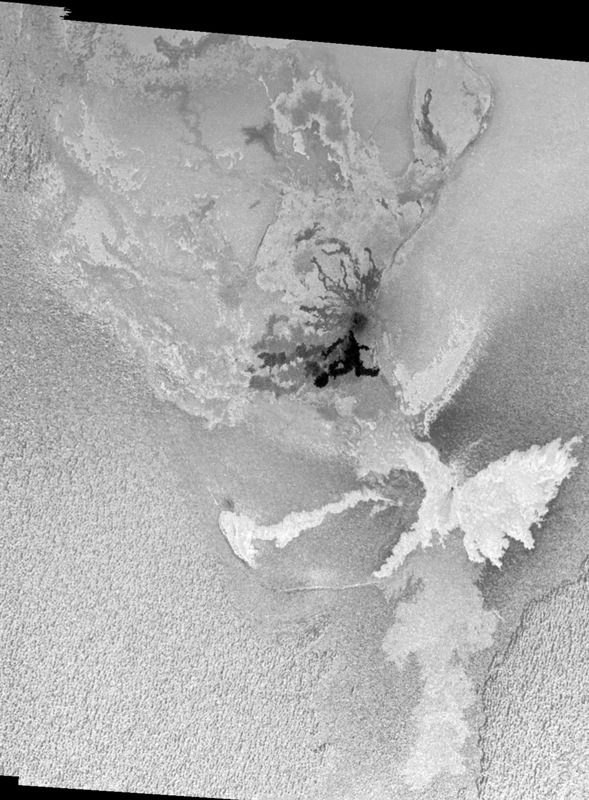 Portions of the main Zamama lava flow can be seen through the rest of the mosaic. This flow has a relatively bland surface with crenulated margins. There are plenty more mosaics to work on but it is getting quite late here. Hope you all enjoy these. I got a chance to read the Io footprint paper that was published on Saturday and made the space news rounds yesterday. The article is titled, "UV Io footprint leading spot: A key feature for understanding the UV Io footprint multiplicity? 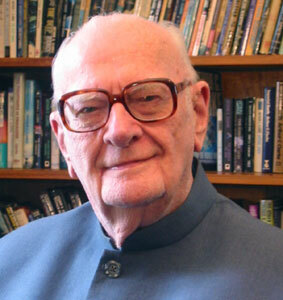 ", and was published in the journal Geophysical Research Letters (Geophys. Res. Lett. or GRL) by Bertrand Bonfond et al. 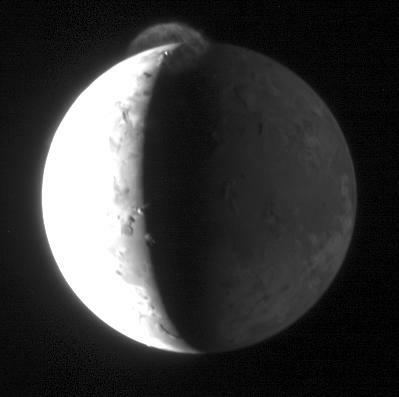 The Io footprint is an auroral glow at Jupiter's north and south polar regions that is generated by infalling ions traveling along Alfvén waves between Io and Jupiter. 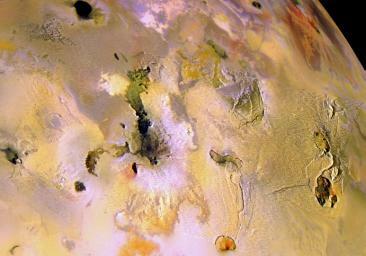 This connection between Io and Jupiter is an Alfvén wing known as the Io Flux Tube. This connection is bent with respect to the magnetic field lines depending on Io's position in the plasma torus as Alfvén waves travel slower through dense plasma (like in the torus). 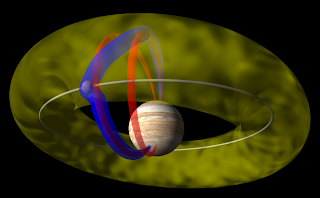 So if Io's is at its furthest point in its orbit above the plasma torus (the torus is tilted with respect to Io's orbit by 7 deg., as is Jupiter's magnetosphere), the waves travel essentially along the magnetic field lines to the north polar Io footprint since it travels through less plasma, while they are significantly bent as they travel to the south polar footprint. Also, the auroral emission at the north polar footprint is brighter than in the south. The reverse is true if Io is at its furtherest point below the torus in its orbit. 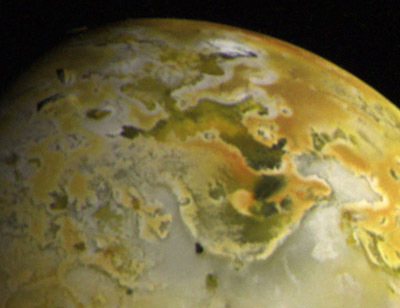 The authors looked at observations of the Io footprint in the UV from the Hubble telescope acquired between 1997 and 2007. 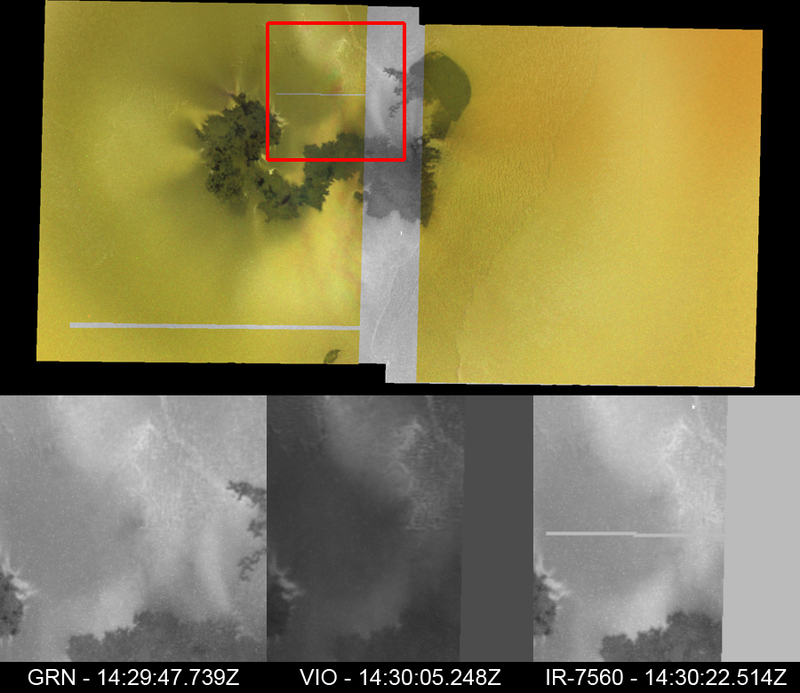 They noted several spots in addition to the main Io footprint. In most cases, they resolved fainter spots trailing the main bright spot, and in some cases, a faint spot leading the main spot. 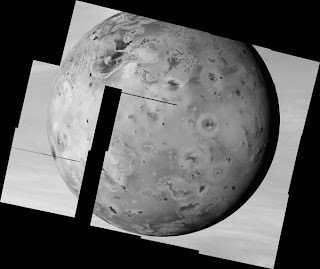 They found that when Io is at its highest point above the torus in its orbit, the spots trailing the Io footprint in the north were at their brightest and there was a spot leading the Io footprint in the south. They found the reverse when Io was at its farthest point below the plasma torus; there were multiple bright spots trailing the main footprint in the south, and a leading spot in the north. They interpret this data to indicate that the leading spot is the result of a connection along magnetic field lines between the brighter Io footprint and the other spot near the other pole (remember the fainter spot also trails the brighter footprint because the Alfvén waves that make it have to travel through more plasma in the plasma torus). 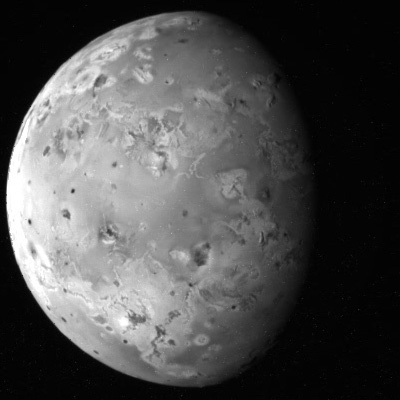 The secondary spots trailing the brighter Io footprint are created by a connection along magnetic field lines from the fainter Io footprint to the brighter one. Since the fainter one trails, the waves will impact Jupiter's upper atmosphere behind the brighter spot. A pretty interesting paper with an elegant model. Since I am not a plasma physicist, I can evaluate the model to see whether it passes the non-sense test, but as a non-specialist, it seemed to make sense to me. 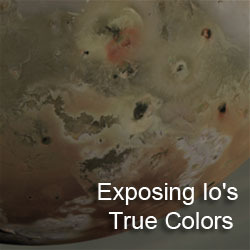 ADDED: I replaced the original image in this post with a cartoon schematic illustrating the various connections that create the Io footprint. 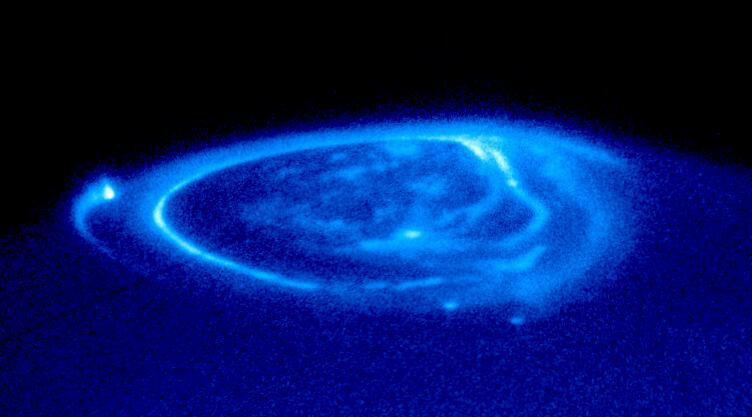 The blue connections are the Alfvén wings between Io and Jupiter. 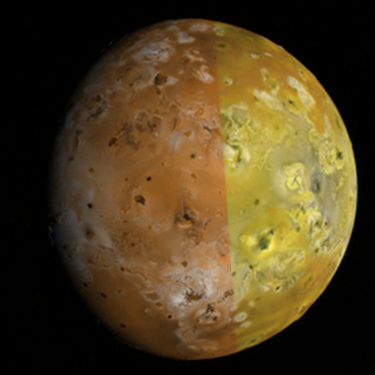 The connection to the south pole basically follows the magnetic field lines between Io and Jupiter because it doesn't encounter much plasma (in the cartoon, Io is near its southernmost point in its orbit so most of the Io plasma torus is above it). The connection to the north is bent as the Alfvén waves are slowed by the plasma torus. The red connections are the magnetic field lines that connection the Io footprint in one pole to the other pole. 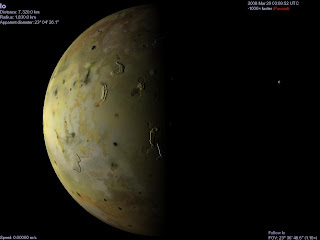 Several observers in Australia and The Philippines observed a transit of Io across the disk of Jupiter yesterday (Universal Time). 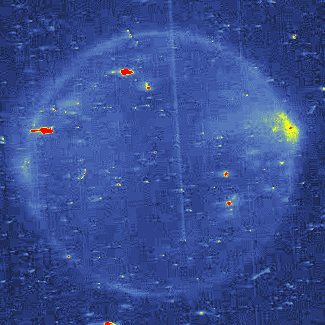 The images some of these observers acquired are posted on the ALPO-Japan website. 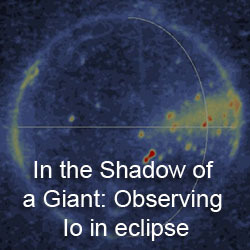 Anthony Wesley acquired an image just prior to the transit showing Io's shadow on Jupiter's cloud tops. 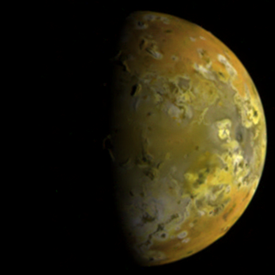 Christopher Go acquired two images showing Io against the cloud tops of Jupiter. 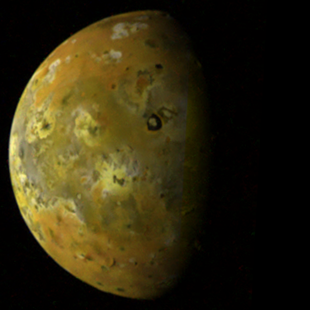 Io's reddish coloration is quite visible. 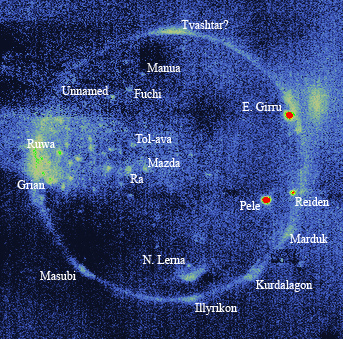 Tomio Akutsu acquired similar images, though he also acquired images in other filter like in the UV, near-IR, and the 889 nm methane band. 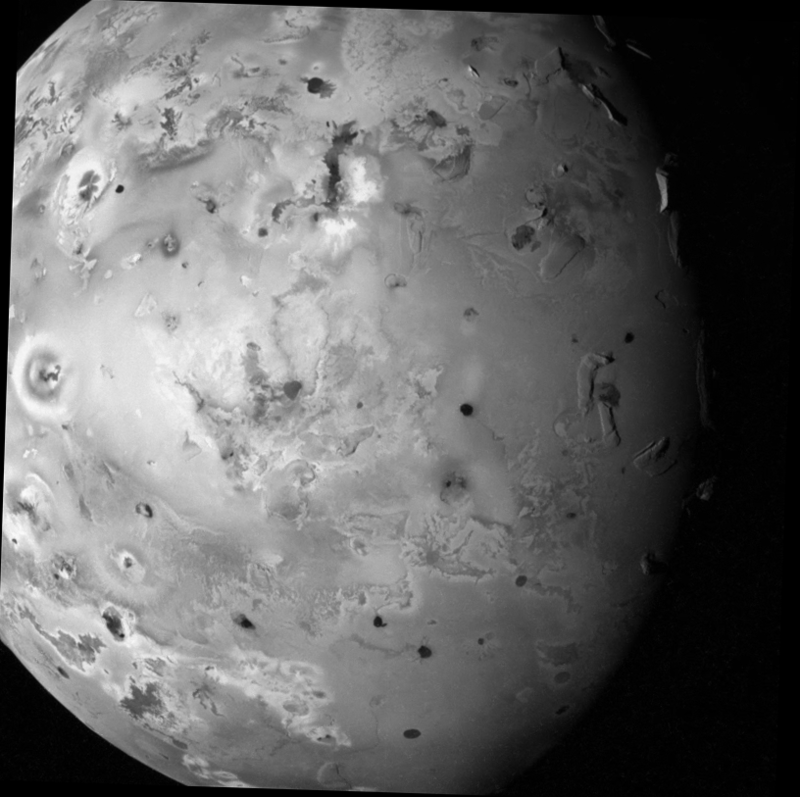 Io stands out quite well in those last two IR filters. 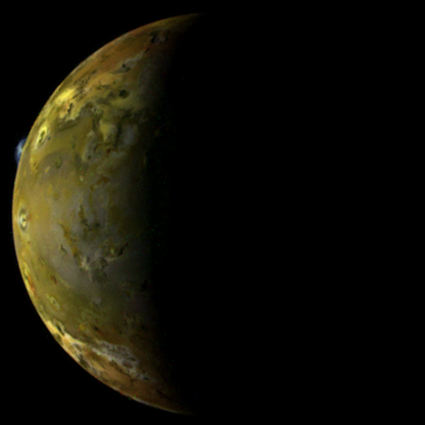 On Monday, Anthony Wesley took a nice shot of Jupiter with Io on its far side. 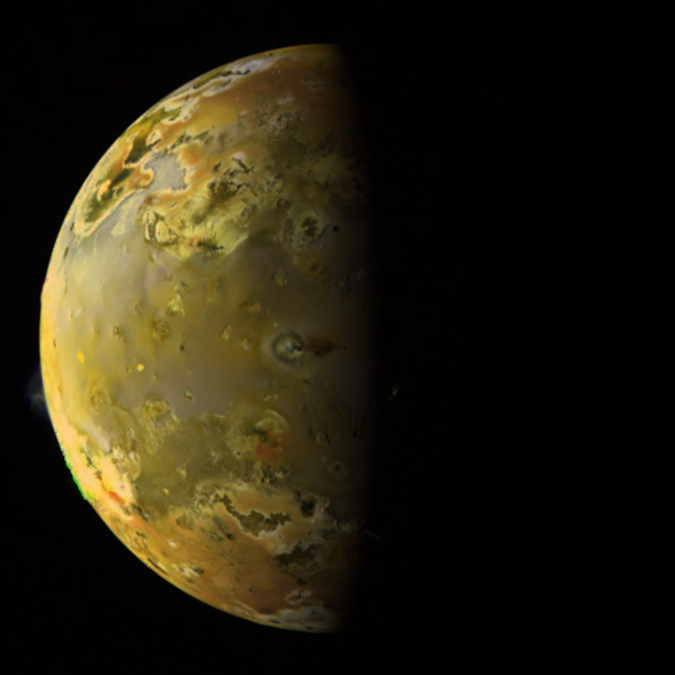 Obviously, don't expect any surface detail for Io, but still a nice shot. Cassini encounters Enceladus, a moon of Saturn that is one of only three moons that are geologically active (the other being Io and Neptune's moon Triton). The closest approach for this encounter is a scant 50 km above the nightside of the 500 km wide satellite. 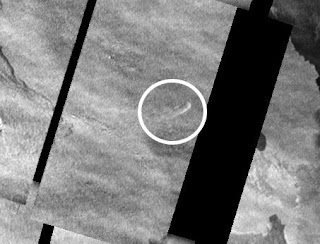 Images are expected mostly from before closest approach, with a best resolution of 200 m/pixel, of the cratered north polar region and sub-Saturn hemisphere. Enceladus enters a 2-hour long eclipse shortly after closest approach when Cassini will fly through the moon's south polar plume, analyzing the dust and gas within the plume (looking for, among other things, trace higher-order organics) and mapping the thermal emission coming from the south polar region, a very youthful area filled with with tectonic fractures, fissures, and ropy terrain. Images and other data from this encounter come down later tonight and early tomorrow morning, so it looks like it will be an early day for me as I work on processing the images that are returned. Thanks to Emily Lakdawalla and wanderingspace.net for the shout-outs on their blogs! I changed the Blogger template used for The Gish Bar Times. While the previous version looked a little more sleek than this one, I also thought it was a little difficult to see sidebar headings and links. They show up a lot easier now, though I still want to experiment with customizing the page. Not today but maybe sometime in the next week I will create a custom header graphic. Comment away on what you think. 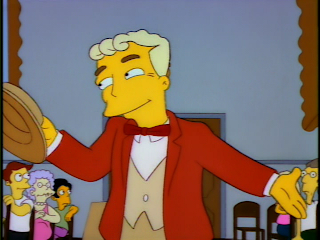 And feel free to use the comment system and not just send me emails. Finished up on reprocessing images from Galileo orbit C10 and worked a bit more on images from orbit I27 today. 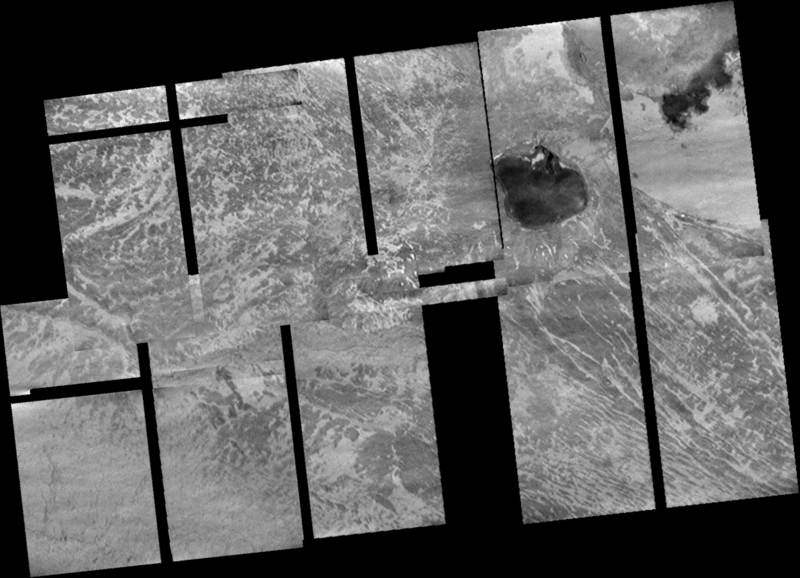 Images from Galileo orbit C10 were acquired on September 18 and 19, 1997. 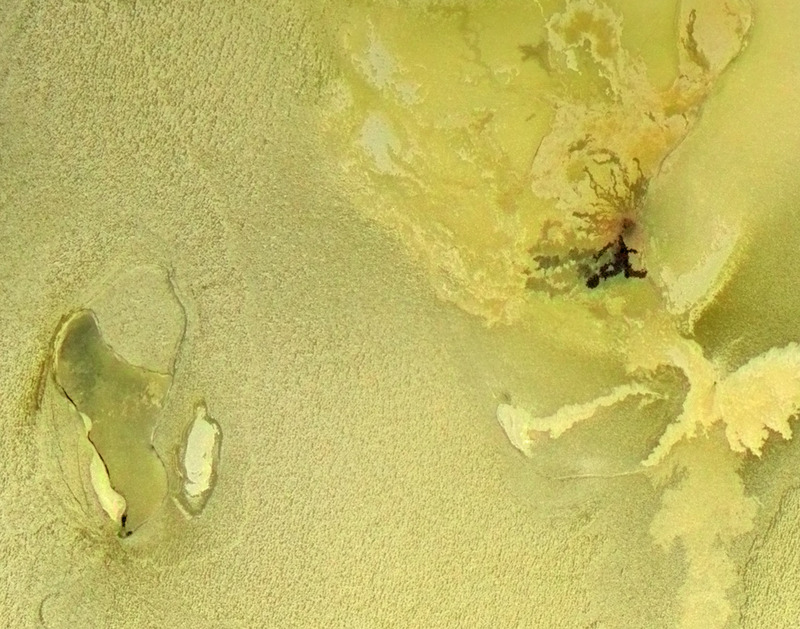 Images from this encounter showed the aftereffects of eruptions at Pillan, Masubi, and West Zal during the summer of 1997. 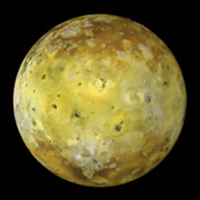 10ISIOGLOC03 shows the trailing hemisphere of Io at 5 km/pixel. The dark pyroclastic deposits from the Pillan eruption are seen to the northwest of Pele (the volcano at the center of the ring of red material at lower left). 10ISIOGLOC01 shows the leading hemisphere. 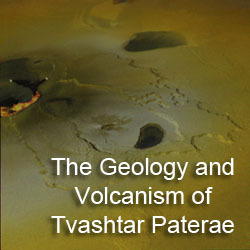 New plume deposits were seen at a volcano west of Zal Patera and at Masubi in that observation. 10ISIOTOPO02 revealed mountains and other topographic features between 60 and 90 West Longitude. 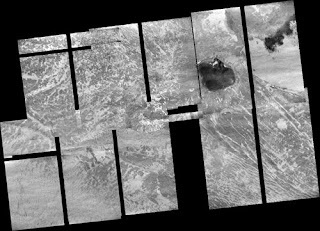 As I mentioned last night, I put together the CAMAXT01 mosaic from Galileo's February 2000 flyby of Io. 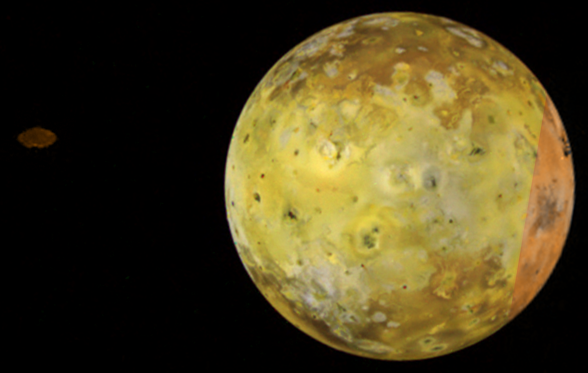 This mosaic shows the region between Chaac Patera and Camaxtli Patera on Io's antijovian hemisphere at 185 m/pixel. 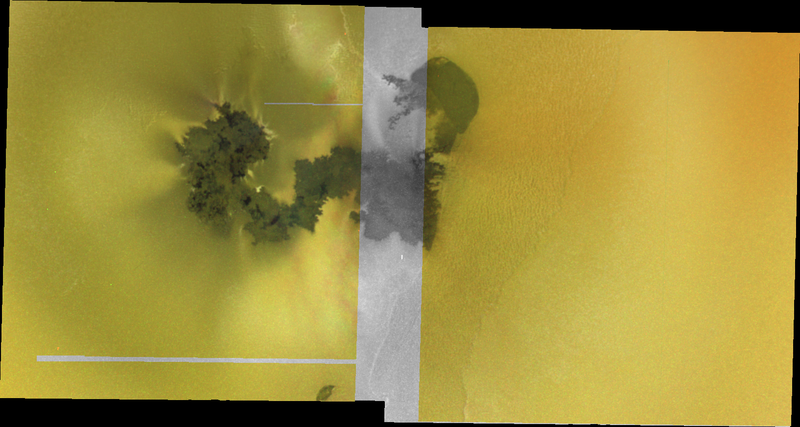 I have now finished a version of the mosaic that combines the high-resolution clear filter data and lower resolution color data from orbit C21. Definitely worth checking out. A similar product was released shortly after the flyby. 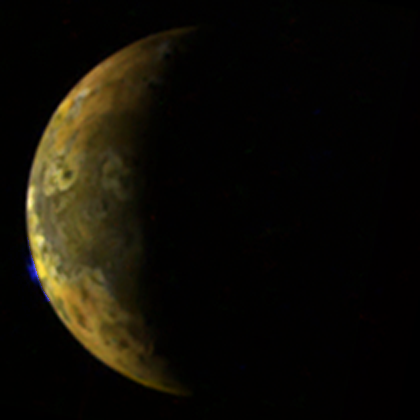 For my version, I used Moses Milazzo's "true" color version of the C21 mosaic, whereas the official version used the false color mosaic. In addition, the release version was posted before all of the fourth frame of the mosaic was returned to Earth, so this version has the entire mosaic.